Thank you for choosing FaithWebsites as your website solution! We are excited to launch your custom design project. Once you have signed up for a Custom Website, you will receive an e-mail from your Content Coordinator as well as an invitation to Basecamp, an online tool we use to track progress, share ideas and communicate with you throughout the process. As you can imagine there are many steps involved in a custom design website project, but we will guide you throughout the process. This page will provide you with a description of eact step in the process. Navigation / sitemap. This is a core step that is often left till late in the project but should start right away. We'll help you figure out how to reach your audience with your new design and offer suggestions along the way, but we can't define your goals, or your audience. The first step in this process will be complete a custom design project worksheet and provide us with site assets including a high-level sitemap, logo files and branding documentation, as well high-quality photos/images for the new site. An online form that is used to help define the goals, purpose and scope of your new website. A PDF of the form is available in case you need to review with stakeholders before submitting the form online. The initial sitemap should at a minimum include the top navigation categories that you expect to appear on your website and any utility links/callout buttons. This will help drive the conversation of site organization and user experience as visitors explore your website. The sitemap you submit can be a chart or visual representation or simply a list. At this time we are looking for 5-10 high quality images of at least 300 dpi that can be used as placeholder images in the design files. These images can be images of the campus, classrooms and other environments, as well as candid photos to help the design team understand the culture and mood of your organization. Throughout the process you will have access to the Dropbox account and can continue to build a library of images. At the end of the process your content coordinator will load these images in your Site Manager File Uploads. For more information on Photography, see our photography guidelines here. We request that your logo file(s) be provided in professional EPS file format. If EPS is not available, a high quality, transparent PNG file is acceptable. If you do not have an EPS or PNG, we can work with most JPGs, but we may be limited or restricted depending on file size and overall graphic quality. Next, we will schedule the Project Kick-off Meeting (via WebEx) with you. This meeting typically lasts 90 minutes. Our experience is that the meeting is much more productive when the group of attendees is limited to two or three stakeholders. Ideally this would include a project manager and an individual responsible for building website content. If there is a large committee for this project, please choose one or two members that can attend the meeting and report back to the committee. Our approach to any design project is to "begin with the end in mind" which supports our goal to create a beautiful site that you can maintain and keep updated. Types of content on the homepage. We will use a variety of other websites (Faithwebsites custom sites and other industry sites) to visually communicate ideals, examples, and features that you may be interested in. During this time, it's important for you and your team to continue your work on site photography, your sitemap, and content. After Project Kickoff, our team of designers will begin working on the wireframe and style tile for your new website. Content Sections for stories, videos, announcements, calendars, etc. A style tile is a visual tool that focuses on the personality and mood of a website. A style tile provides fonts, colors and style collections that will be used throughout your new site. When reviewing the style tile, be sure the following accurately reflect your branding standards/desired look and feel. Your Wireframe and Style Tile will be ready for your review and feedback within 1-2 weeks after the Project Kickoff. The Wireframe and Style Tile will be delivered via InDesign, an online project board. We will have tour points within the project board that will provide an explanation of what you are seeing. You will be able to reply to any of our tour points or start your own comments. 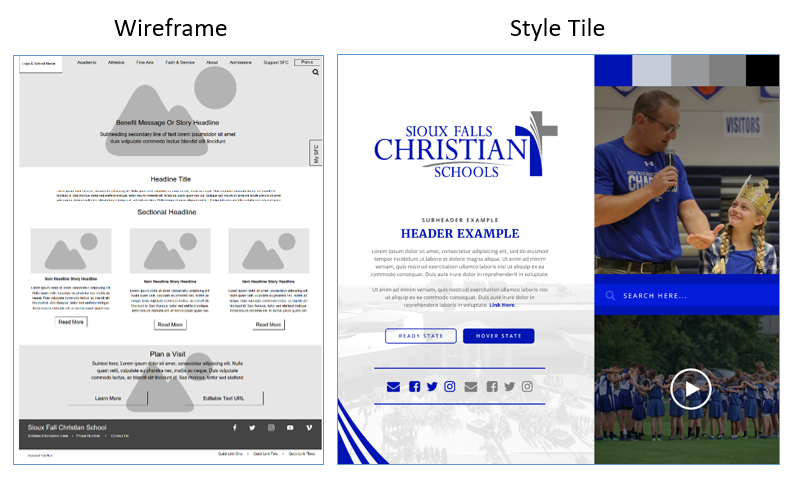 Once you have approved both the wireframe and style tile, the Design Team will begin designing your new website. The design will be delivered in the same InDesign project board as your wireframe and style tile. To keep the project moving, it's important to move through the rounds of feedback, changes and approval in the design stage quickly. During this phase, you will need to finalize the main navigation categories, social media icons, footer address and text, sectional headers, home page content sections, as well as other items requested by the design team. The header and footer will be the same site wide. Layout options on the interior pages will be selected in the Faithwebsites Content Management System (CMS). Options include banner images, interior navigation menus, main content area tools, right side content area tools, headings, pages titles and more. Upon Design Approval, the following items will be added into Basecamp Project as to-do with a due date. Not having these items will create a delay in the project. Sitemap (if not already submitted). Please see our Sitemap page for additional details. All social media and third party links. Your project manager can give you a full listing, but this can include Facebook, Twitter, and any links for icons and navigational buttons on your design that are not internal pages of your site. Google Custom Search code. If you have elected to have a custom search on your site (not required), we will need you to provide us with the code for that search. Any final images that have been requested by your Content Coordinator. Any email address that may be linked to from the footer (if applicable). If you are an existing Faithwebsites customer, we will work with you to decide on a wrap/conversion or old-to-new site process. Any other items requested by your Content Coordinator. Once we have received your full approval on the designs, we move the project into the Coding/Implementation/Testing phase. Depending on queue volume, this process typically takes 3 to 4 weeks. During this time we ask that you and your website administrators attend one of our live new user training sessions. Live New User trainings are typically scheduled 3 times per month; join the session that is most convenient for you. This training or previous experience working in Site Manager (our FaithWebsites CMS admin site, is a prerequisite for the Custom Site Training explained below. As we begin testing your site, your content coordinator will contact you to schedule your Custom Site Training! This training is to cover all the customized elements of your website. Anyone in your organizations who is, or will be responsible for the daily or regular content building and updating should be attendance. With this kind of detailed content, you create a checklist of what needs to be written, compiled, organized, photographed and more. Your Custom Site training will be conducted via WebEx with your Content Coordinator. The Live New User training mentioned in the previous section much be completed by all attendees. Anyone in your organization who is or will be responsible for the daily/regular content building/updating should be in attendance. Your Content Coordinator will cover all of the customized elements of your website. After the training session is complete you will receive access to your new website and can start building your content. Our support team is available to answer any additional questions you may have along the way. You may reach us by clicking on the support tool within your Content Management System or visiting our online support center and selecting Live Chat, Video Tutorials, Live Trainings or Website Support. If you've been organizing and building your content as we recommend, many customers find that adding content to their new site can move quickly. While every customer and project is unique, some customers have been ready to go live within 2 weeks, whereas others have taken more time to build and have gone live in 4 months. This is entirely up to you and your team. We are ready to assist youwhenever you are ready! Click here to learn more information about taking your site live.